A research article on Malawi’s fertiliser subsidy programme claims organised crime and corruption linked to the scheme has undermined its potential benefits for the poor. The fertiliser subsidy programme has been heralded by the international community and organisations such as the Food and Agriculture Organisation (FAO) as a successful pro-poor strategy. 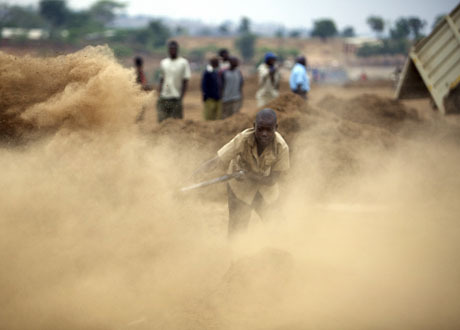 However, Richard Tambulasi, a senior lecturer at the University of Malawi, claims that corrupt local officials are working with organised gangs to take advantage of the fertiliser subsidy programme. His article is featured in this month’s African Security Review published by the Institute of Security Studies, South Africa. He is now carrying out further research based on some of the preliminary findings in his article. The fertiliser subsidy programme, which was launched in 2005 to help boost Malawi’s food self-reliance capacity, offers fertiliser to poor farmers at a considerably lower rate than market value. Beneficiaries of the programme were given coupons to purchase the subsidised fertiliser. For example, the 2007 market price for fertiliser was K4,000 but under the programme the subsidised fertiliser cost K950. Richard Tambulasi spoke to Panos about his findings. What were your main findings? The main finding is that the fertiliser subsidy programme has increased avenues for corruption in Malawi. Criminals take advantage of corruption in the country as a mode of operation to get subsidised fertilisers which they either sell locally at higher prices or smuggle to neighbouring countries. Why is it important to find evidence for the link between corruption and organised crime? The details of this link have to be established in order to develop a comprehensive and effective mechanism for dealing with organised crime and addressing corruption. If the link is not well understood, attempts to deal with either of these two will be short-lived as they will only address symptoms of the problem rather than the complex root causes. How prevalent are corruption and organised crime in the fertiliser subsidy programme? On the one hand you are talking of big single instances, for example a case in which 17 businessmen in Lilongwe diverted fertiliser worth millions of kwacha, as reported in the newspaper. On the other hand, you have small instances where a person is caught with one or two coupons of fertiliser subsidy obtained through corrupt means. And in between these two extremes there are a number of cases of various magnitudes. Why are your findings new and interesting? The link between corruption and organised crime has not been clearly established. This article contributes to that understanding. There is no study in an African setting that adequately establishes this link and therefore, this study fills the research gap. Did anything surprise you when you finished researching this case study? Yes I was very surprised. I initially regarded corruption as a separate issue and the link established between corruption and organised crime was a surprise. The second surprise was the international dimension in the fertilser theft syndicate. How has globalisation helped organised crime in the fertiliser subsidy programme? Globalisation has helped because these crimes have been internationalised. You find instances where the fake coupons are printed in South Africa, as it had advanced technologies that are likely to make the coupons very difficult to detect. You also have instances where the fertiliser is sold in neighbouring countries, where it fetches very high prices. Zambia, for example, has been a preferred destination, as well as Tanzania and Mozambique which have been reported destinations. What will you do with your policy recommendations contained within the research? The policy recommendations are designed to help policy-makers in terms of strengthening the programme so that loopholes for corruption are minimised, hence cutting the involvement of organised criminals in the programmes. How will you get your recommendations to the people with the power to do something about it? Do you see that as part of the role of a researcher looking into this kind of topic? It is the role of a researcher to disseminate findings so as to reach the policy podium for appropriate actions to be taken. The ideal situation would be to organise a conference attended by concerned policy makers in the country where the paper would be presented. What obstacles do you face in getting your findings to the right people? The main obstacle that would prevent me from organising the conference now is that I am not in Malawi at the moment. I am in England doing my PhD in public policy and management.